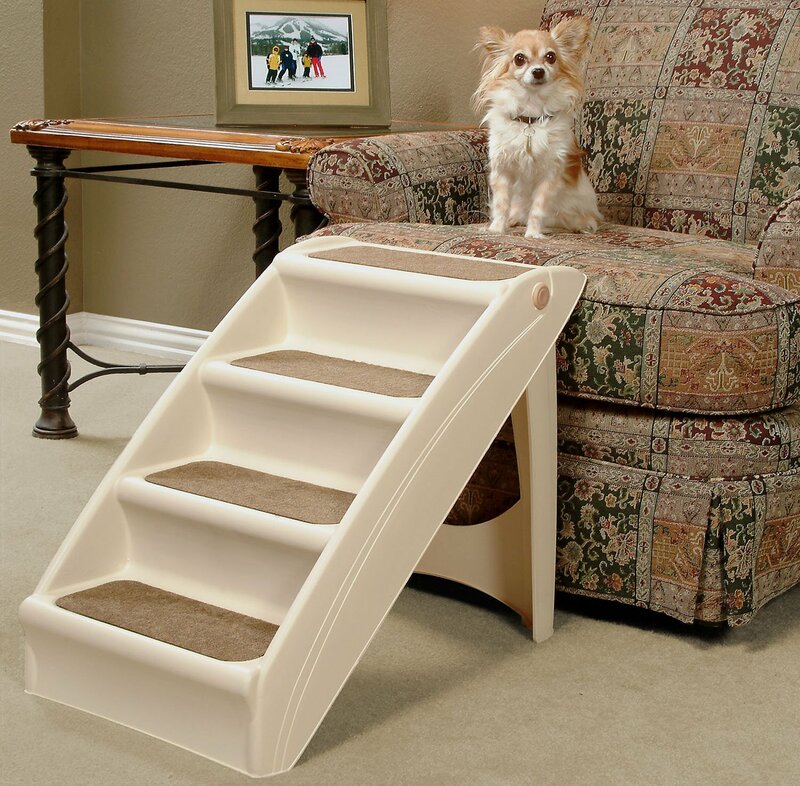 Pet stairs are steps which are specifically made for dogs and cats too. Maybe you are wondering why pet owners should even consider investing in stairs for their pets. Perhaps you'd also like to know a little more about what this sort of equipment can do for your pets to improve their lives? I hope the subsequent paragraphs will help to clarify some of the questions you may possibly have. Before I proceed, did you know that a simple set of pet stairs can drastically reduce the chance of your dog developing a joint or bone problem such as arthritis or hip dysplasia? Pet stairs, also known as pet steps, are essential aids which allow pets easily to get to places in the home; places which you want them to access, and where otherwise you might have to lift or even carry them. These stairways will help your pets to move easily and safely about the home and they can very quickly get accustomed to using them. These steps will also mean that you will be relieved of the sometimes awkward chore of lifting and carrying your pets to various locations. Especially with larger, heavier dogs this can be quite onerous at times and can take a toll on the backs and joints of the owners themselves. Sometimes man's best friend is too small to enjoy our company on those high surfaces such as couches and beds. These little puppies need pet stairs to enable them to reach high places because frequently picking up your pet can put a strain on you and your pet. Pet stairs have many benefits such as car entry, furniture access, and basic pet training. Both cats and dogs can enjoy the benefits of having their own personal set of stairs to help them reach our world. Car access is the most popular use for pet stairs. Our furry friends love to travel with us in the car to the grocery store, the veterinarian, and on family trips. Instead of picking up your pet or making them jump into the car, you can place Pet stairs on the ground beneath the car door to provide easy and safe access to the car for your dog. Without stairs, it can be difficult for your pet to get into the car or on top of the car seat. One great thing about a puppy is that you can carry him in your lap, but it may not sound realistic to always carry him while you move around your house. You can make use of pet stairs to encourage your favorite pet to come and hop in your lap while you are sitting on a sofa. These stairs can serve as a perfect accessory required to keep your puppy happy. With these stairs, you provide your pet with a chance to get to his favorite spot without having to go through a lot of hassle. Another great selling point for these stairs is that they are extremely lightweight and portable. You can take these stairs to any place you go. That's another reason why many people rely on these stairs when they want their pets to step up into trucks or cars. In addition to these, there are several health benefits of using these pet stairs. The interesting thing is that these benefits are not only for your pet but for you as well. For instance, your dogs or puppies enjoy healthier bones when they don't have to jump on and off a high place. Using these stairs takes pressure off their joints and keeps bone injuries and problems like arthritis and hip dysphasia at bay. On the other hand, these stairs offer an amazing health benefit for you. With these, you don't have to bend down to lift your pet. You don't have to put extra pressure on your back, which means people with back problems can take a sigh of relief. The bottom line is that pet stairs are important for all pets but they are necessary for puppies, old, and overweight dogs. Click this link for more information as well as purchasing your Pet Stair Online.